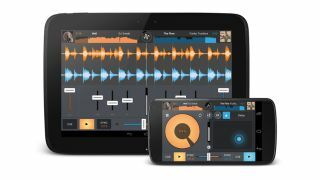 Cross DJ 2.0 is compatible with tablets and phones. Coming up to a year after it landed on Android, Mixvibes has launched version 2.0 of its Cross DJ app. The headline is the developer's claim that "feature wise, the gap between DJing on Android and iOS doesn't exist anymore." This is because Cross DJ 2.0 has a waveform view, separate tabs for decks A and B, key detection (useful for harmonic mixing) and a synced sampler. You can find out more on the Mixvibes website. Cross DJ: full version costs £6.99/$9.99/€8.99, while Cross DJ: free version can be downloaded for nothing but offers in-app purchases. The update is free for all current users.